Clover is an expert present giver, in fact its her gift that has led to her job as a personal shopper for Giftland. Just by talking to people she can work out what the perfect present for a complete stranger would be, but yet in her personal life she is always disappointed by presents she is given. In fact her family know her so little that they insist on buying things off a wishlist, instead of giving Clover what she really craves, a surprise! Cade is a big name actor who is hiding out in New York in the house opposite Clover's, after a very public break up. He just wants to experience some peace and quiet and stay out of the eyes of the paparazzi. He does though keep having run ins with his rather clumsy neighbour Clover, and finds he can't stop thinking about her. It really took me a while to warm to Cade, Clover just had a way about her that I liked instantly, and found her whole personality quite interesting, in a mix of slight clumsiness, fiestyness and all around love of the Christmas period. Whereas Cade was harder to get a feel for, however after a few prolonged interactions with Clover, I realised just what a sweetheart he really is. Cade makes these romantic gestures that for a person of his stature aren't particularly flashy, but rather show an understanding of just who Clover is. I don't really want to mention the specifics but I would amazed if you didn't start falling for him as the story progresses. I found A New York Love Story to be a very enjoyable story that was very easy to read. It's light hearted and definitely takes in New York at Christmas, and the banter between Cade and Clover at times is hilarious, as is one of the running jokes in the book about a certain body part that Cade once signed an autograph on! I believe this is Cassie Rocca's debut story and I am excited to see what else she writes in the future. Thank you to everyone that voted for this book this week, it was definitely to my eyes a shock result, but it turns out to be a very welcome shock. 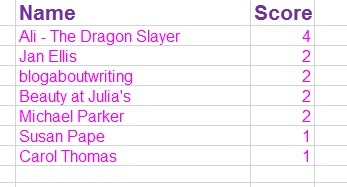 Take a look at the new choices to have a say in my next Monday review. I am still in shock at the result from last week. I honestly was expecting it to be a Cathy Bramley white-wash, and that I would be trying to read two books as a result of it. However as the vote progressed I realised just how close it was, and I wasn't sure who had won until I counted it all up and I'm delighted to say that A New York Love Story did edge it. From my point of view the most exciting set of results for ages on this feature, and long may it continue! 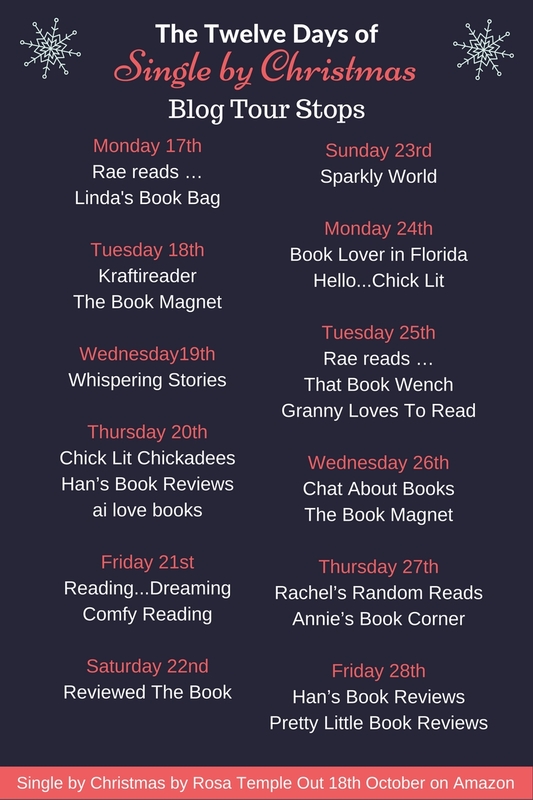 From now until probably the end of November each week I will be giving you a choice of 3 books from my Winter/Christmas books, to start getting us all into the festive spirit. I will probably be buying them as fast as I read them, so hopefully will get a different selection each week. 1 - Not Just For Christmas by Alex Brown - I've had this on the kindle for weeks since it was released and I can't believe I haven't just sat back and read this new short story in the Tindledale series. 5 - The Trouble With Mistletoe by Jill Shalvis - I won this recently in a competition, I know its a romance and that I really should read it according to my best friend, but I've never read anything by the author before. 8 - Her Christmas Cowboy by Katherine Garbera - Well I love Christmas and I am partial to a cowboy, so I am very curious about this Christmas romance. A gorgeous story of chance meetings and unexpected friendships . . . because sometimes what you’ve always wished for isn’t necessarily what life has in store . . . I actually have no idea how on earth I am supposed to review this. I want to tell you about the story, which although is briefly mentioned in the blurb, the actual methods used and the way everything is shown to the reader feels quite different, but yet I fear mentioning the specifics could be a spoiler. 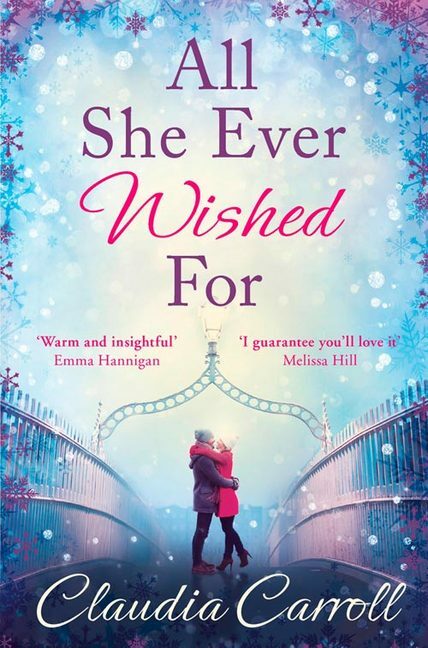 So lets see what I can safely say..
Tess and Kate meet briefly on a rainy evening on the Ha'Penny Bridge, and then two years later their lives entwine in an unexpected way. The majority of Kate's story is told in flashbacks, often with accompanying newspaper articles, since she is a celebrity. Tess's story is told in the present and we follow on her journey, of wedding planning, the mixing of two sets of parents and the event she just can't get out of, no matter how hard she tries. The story telling was intriguing as the whole time there were some unanswered questions about Kate and her husband, and even at the end I still wasn't completely convinced understood some of the reasoning behind key decisions. Can't help but wonder whether there may just be a sequel to this book. All She Ever Wished For is really the story of two relationships, Kate's and Tess' with their respective partners, but also Kate with her best friend, and Tess with her family, as well as a whole group of new strangers, one of which in particular stands out. Over a two week period Tess has a lot of decisions to make, and Kate's life will completely change too. I really did enjoy the book, and was hooked early on, and as the story progressed, I just wanted to be reading and not doing other things, as I was very curious as to how everything would turn out in the end. All She Ever Wished For has secured one thought in my mind though, is that the newer Claudia Carroll books are so much more accomplished than her earlier ones. Thank you to Avon and Netgalley for this review copy. This was my honest opinion. 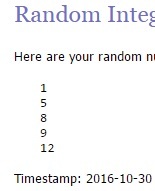 Well it has been a mixed month this time, some weeks had quite a few participants, and other we had our regular guesser, who has done incredibly well in previous months. Congratulations to Ali - The Dragon Slayer, on winning the final month of Truth or Lie? I am back with a one of special edition next week where everyone that has a guess, will get entered into a draw for a star prize courtesy of our contestant! And for those of you that have been waiting with bated breath all month, here are the lies revealed for Sue Featherstone, Sue Moorcroft, Alli Sinclair and Jane Cable. Week 1- I had Sue Featherstone as my guest, and she had some great lies. So here is the truth! Question 3 - What was your most memorable holiday ever? Truth: New York, September 2014, with my husband and two grown-up daughters. We were supposed to go to NY to celebrate my 50th birthday a few years earlier but number 2 daughter had surgery a week beforehand so we didn’t make it. It was every bit as wonderful as I’d thought it would be. Lie: Our first holiday together as a married couple (honeymoon in Paris excepted): a caravan in Skegness. Doesn’t sound very exciting but just the two of us. What could have been better? Question 7 - What is your dream job, and have you tried to achieve it? Truth: I’ve been incredibly lucky. I wanted to be a writer so my first job was as a journalist, then I moved into corporate communications so still writing and now I teach other people how to write. And I’ve just written my first novel. Doesn’t get better than this. Lie: Like every good Catholic girl I fantasised about becoming a nun and saving the world through prayer and good deeds. Then I grew up and discovered I wasn’t cut out for praying or saving the world. Question 13 - If you won the lottery, how would you spend the money? Truth: Depends how much I won. My last lottery win was £10, about a zillion years ago and I put it straight in my purse and probably frittered it away on a bottle of dry white wine. I like to think I’d share a bigger lottery pot with those I love. Lie: I’d have as much fun as possible spending it on high living, exotic holidays and expensive cocktails. I’d also treat my husband to a fast car. Week 2- I had Sue Moorcroft as our contestant, I wonder if her rather succinct answers made it easier or harder for you to guess! Question 9 - Besides reading, which I am guessing is a given, what other hobbies do you have? Question 14 - If you won the lottery, how would you spend the money? Week 3- We had Alli Sinclair visiting us from Australia, let's see if her answers got you stuck down under! Question 6 - Can you describe for me what your perfect day would involve? LIE: A long jog along the beach, followed by a leisurely breakfast of green juice with extra kale, then a few games of tennis, and if the weather’s nice (but it’s a perfect day so it will be sunny, right?) then spend the afternoon gardening. TRUTH: A sleep in with hubby making one of his fabulous hot breakfasts and bringing it to me while I catch up on emails with friends. Then it’s off to the beach on my perfectly sunny day (but not too hot!) and building sandcastles with the kids. Lunch would be at a seaside restaurant and we’d share a seafood platter with extra crayfish (lobster) and a beautiful glass or two of a crisp, fruit white wine. I’d have some time to read in the park while the kids play with hubby and then we’d go to a new Mexican restaurant and meet the chef who tells us all about the history behind each dish. Later that evening we’d go home and watch an old musical with Gene Kelly or a romantic movie that is bound to have me reaching for the tissues. Oh, and I will add that all the housework will magically do itself, the kids are perfectly behaved and everything I eat doesn’t go straight to my hips. Question 9 - What is your best childhood memory? LIE: Going to the snow when I was a very young and building a snowman that was almost twice the size as me. I remember frozen fingers (even though I had gloves on), snowflakes being caught in my eyelashes, and a super cold nose—but all that faded into the background as I laughed with my parents and brother as we created a memory that would last forever. TRUTH: My best childhood memory is lying on a bed with my grandma and staring at the blank wall with her. We’d make up stories and tell each other what was happening as we pretended that blank wall was a movie unfolding before our eyes. That’s my very first memory of storytelling and one I will cherish forever. Question 10 - Did you have an invisible friend as a child? If so please tell me about them. LIE: I had twin invisible friends – Molly and Gertrude. They were the same age as me and were super brave. They always said the things I was too scared to, and they often goaded me into doing things I wasn’t brave enough to do (which sometimes got me into trouble!). I turned ten and they disappeared overnight – it broke my heart and I don’t think I’ll ever fully get over it. TRUTH: I never had an invisible friend growing up, unfortunately, but I had a very active imagination so I had a cast of characters that would visit me when I was creating my stories. Week 4 brought Jane Cable to the blog, so I won't keep you in suspense any longer with her lies! Truth: After my father died I dreamt that we were dancing together as he slowly became a skeleton. It may have been macabre but it was strangely comforting at the same time because we were able to talk to each other. Lie: It was actually the dream Alice has about Owen in The Cheesemaker’s House the night after she first sees him, swimming in the river. It was just a gentle kiss on the lips from a man I didn’t know but I could still feel it when I woke up. Question 4 - What was your most memorable holiday ever? Truth: A few years ago we went to a resort called Kihaad in the Maldives. We chose the location and the time of year because we knew the manta rays came in to feed and we weren’t disappointed. We spent almost an hour in the water with them and it was certainly my most memorable holiday experience. Lie: A trip to Newquay in Cornwall in the summer of 1987. We stayed with my friend’s Auntie Megan who owned a surf shop and fell in love with her boyfriend Robin who seemed the epitome of cool to two teenage girls. Question 10 - Besides reading, which I am guessing is a given, what other hobbies do you have? Truth: I love cricket. Not playing it, but watching it, listening to it, and being involved in the game in any non-playing capacity. At one point I wrote for the Cricket on Five website and had the pleasure of discovering that Geoffrey Boycott isn’t always the miserable old so and so he’s made out to be. Lie (My husband grows the dahlias! ): I am passionate about my garden, in particular growing dahlias. I never tire of their wonderful jewel colours and I planted a whole bed in memory of my mother after she died last year. I even post pictures of them on Twitter sometimes. I never intended to write psychological fiction. I’ve always loved reading thrillers and chillers but I never really felt that I had it in me to write one – let alone two. 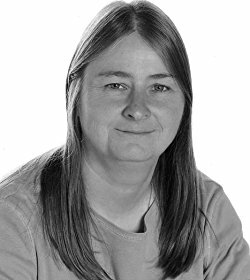 I’ve written comedy, romance and even tried a bit of young adult dystopian adventure but I’d always steered clear of anything approaching suspense and crime. When I started to write ‘Forgotten’ it wasn’t really about what had happened to my central character as much as what was going to happen to her. It was about her identity and her ability to rebuild herself. The crime elements seemed to fit perfectly with that quest for self-knowledge. 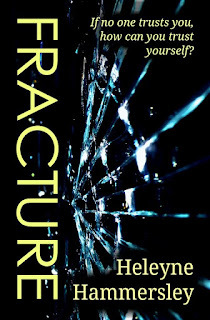 My second novel ‘Fracture’ – published by Bloodhound Books on October 28th – is perhaps a more traditional thriller. It has a murder, a detective, a suspect and a few twists and turns. But, again, it is much more than that. At the heart of the story is the central character’s need to establish her sense of self and not become lost in somebody else. Again the traditional crime elements seemed to fit perfectly around the character’s emotional and physical journey. I’m writing something a bit different at the moment. It’s more of a police procedural and is based, in part, on my own experience of growing up in the late seventies and early eighties. There’s a couple of murders, a couple of cops and a villain who may or may not be hiding in plain sight. Yet, unintentionally, that theme of self-discovery and identity is lurking again. The main character has returned to her childhood home after many years away and is forced to confront how her early experiences shaped her and added to her identity. I taught English for many years and one question that students asked again and again was ‘Did the author really put all this stuff in this book/poem/play deliberately or are we just looking for patterns and themes and seeing what might be there?’ The honest answer? I don’t know. I don’t think I’m obsessed with identity and self-discovery yet up it pops up in a lot of my writing. I know who I am, I know where I’ve been and what has shaped me so where does this recurring theme come from? I’m sure a psychotherapist would charge me a lot of money to give me the answer but I’m equally sure that I probably wouldn’t agree with his/her assessment. And that’s what I love about writing. Sometimes my characters do things that I wasn’t expecting, sometimes the plot takes a turn that I didn’t plan for and often, it seems, I stick to a theme even though I’m not consciously aware that I’m doing so. 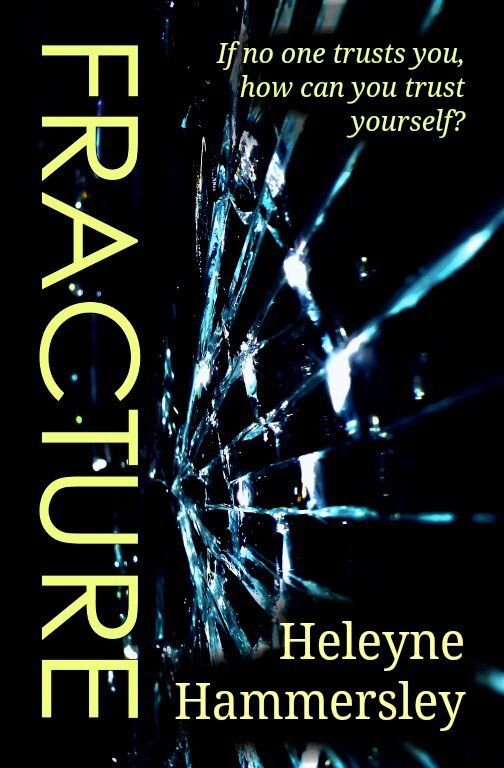 Heleyne's second novel - Fracture - is due to be published by Bloodhound Books later this year. It was the announcement of a book called Christmas at Rosewood which triggered me to buy and then read The Last Days of Summer. You see I love Sophie Pembroke's Christmas titles, so clearly want to read the newly announced book, but given its the sequel to The Last Days of Summer, and I had some time on my hands I thought I may as well play catch up and read this. All I can say is don't wait for your own trigger, just go out and read this book, it turns out that the author is not just a very accomplished festive story teller, but can write a big summer story too. I was shocked multiple times during the story at the way the plot was progressing. This is definitely an unpredictable book. I felt the story started off not slow, per se, but perhaps sedately while you learn just who Saskia is, why she hasn't been back to the family home for two years and why she still may not be entirely welcome. We also learn just who the full family is, all three generations of them. When Nathaniel, Saskia's beloved grandfather makes an announcement during the Gold Wedding Party the cat is thrown amongst the pigeons, but just what are all the members of the family hiding that will case them to react the ways they do. After the announcement, I found the book became utterly addictive and I just couldn't put it down. I couldn't wait to see how it would all work out and trust me when I say there are a lot of turns you probably won't see coming and a lot of nice touches. 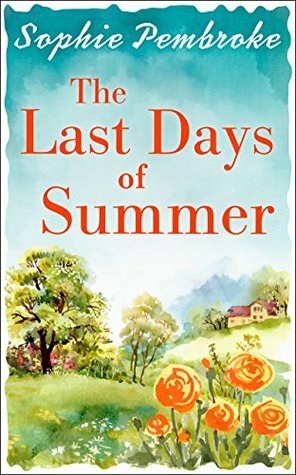 The Last Days of Summer is a fantastic story of family, or intrigue and of those skeletons in the family closet you generally wish had been forgotten about. There is a romance element in there too, as well as a strong storyline of forgiveness. It is the story of Kia's relationship of those around her, and how although having an imagination is fantastic, its great to be able to see "the truth in fiction". I will certainly be reading more books by the author, and not just at Christmas time, and I definitely can't wait to return to Rosewood, which is the marvellous family home, and all its lovely grounds, in the winter. 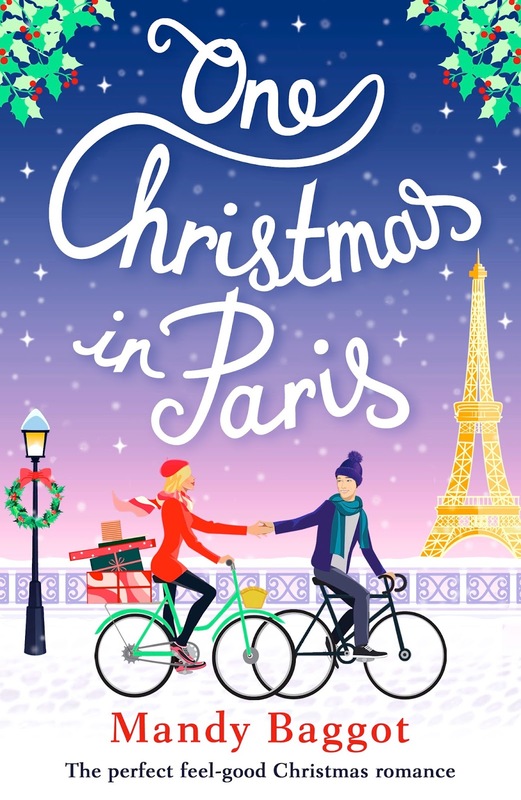 Christmas...Paris..French Food.....a girl trying to work out who she is...a dashing photographer....Christmas markets...and Mandy Baggot. What a fantastic combination, that has produced a wonderful story. Lets take these one thing at a time - Christmas. There are definitely a lot of festive elements in this book, and I loved some of the smaller details, about baubles and other decorations in various places. France at this time of year sounds beautiful. Which brings me on nicely to Paris, well the Eiffel Tower plays its part in this story, as do love locks and many other landmarks in the city. There are also some lovely off the beaten track places, some that only locals would know. The romantic night time trip down the Seine is definitely a highlight. Ah yes French food, Ava has a massive fondness for Camembert, and snails in garlic butter, and just about any food she can get her hands on. Ava has a controlling mother who has been trying to turn Ava into a model since the age of 4, and now in her twenties she has had enough, and I think that is in part why she has such a voracious appetite for all the delicious sounding food in Paris! Ava is trying to work out just what it is she wants to do with her life, she knows it isn't modelling, nor is it selling real estate. She has a passion that she has buried for years, that starts to be realised with the help of her friend, Debs while they are in Paris. It is Deb who has persuaded Ava to come to France with her, as she needs help with various things including some amateur private investigation, and the writing of some magazine articles. Julien is the dashing photographer, who is gorgeous, and isn't entirely truthful to Ava initially. It took me a while to warm to him fully but once I had, I may just be slightly in love. His story is moving, and touches on up to the minute issues, and generally he has a lot of depth about him, but I'll not go into any detail as he is best discovered for yourself. The Christmas markets in Paris just sound wonderful, and there are a couple that Julien takes Ava to that are brilliant. A great mix of food for Ava, and lots of little trinkets that Deb loves to buy, with lots of atmosphere and festive sparkle. And the last piece of my fantastic combination is Mandy Baggot, I am a bigger fan of hers after every book I read, and I think this may be her best yet. 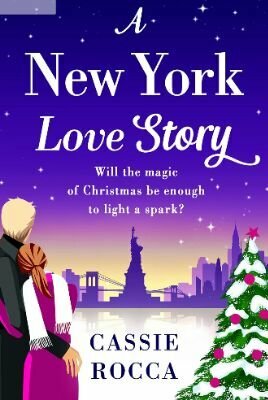 I have a real soft spot for her New York based Christmas book of last year, but there is just something about this which feels more mature and turns the book into an all around wonderful story. Thank you to Netgalley and Bookouture for this review copy. This is my honest opinion. The Killing Game is easily a content for thriller of the year, and in my top books for the year. If only every thriller could get my adrenalin pumping, my heart racing and grip me for 3-4 hours of solid reading, and I would probably read a lot more thrillers. For this is truly special, and I suspected it could be when I read the blurb. When the few lines on the back cover of a book, hook you in the way this one did, it is usually a very good sign of what is inside the covers. The Killing Game reads like a live action film, you are seeing everything that is going on, from a couple of view points, to really get a feel for all angles of the action as it plays out. In this case there are the people inside the restaurant, the one that isn't meant to be there, the television reporters both in the studio and at the scene, as well as hints as to what the police are thinking. All of these people are all just wondering a few things, who is the masked gunman, will anyone get out alive and why? Now I'm not going to tell you any of that, as it would completely spoil the enjoyment of this story. The question I'd like you think about though is what you would do if in a siege situation? Would you give into demands, try and be a hero, or just pray you were insignificant enough not to be noticed.? And how would you feel? 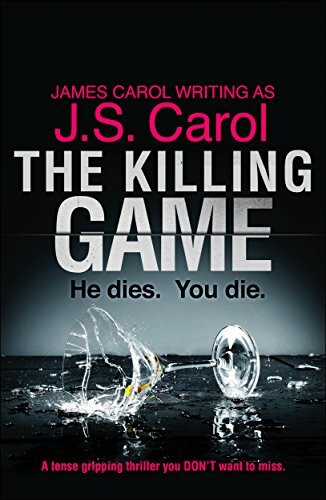 Well to get some ideas of how you may feel, read The Killing Game, as it gives what I can only imagine to be a very authentic account of such a situation, and how it could play out. The whole book takes place over four hours, in half hour segments, and with it, new revelations are brought about, more links are made between everyone and the outcome had me gasping with shock. My heart is still racing as I write this, I was so absorbed in the action. This is my first book by JS Carol, and I am so glad I took a chance on it. This is definitely the sort of thriller that I love to read, fast paced, well written, has you gripped and thinking from the first page, and more importantly impossible to put down. A word of warning though, only start this when you have time to read for a decent chunk of time. Thankfully I had a free afternoon, and was able to read the book in one sitting. Had I been doing my normal thing of commute reading, I dread to think where I would have ended up today, as for a few hours I was completely unaware of the world around me. The Killing Game is a pulsating and addictive thriller and was a joy to read. Thank you so much to Netgalley and Bookouture for my copy of this book. This was my honest opinion. 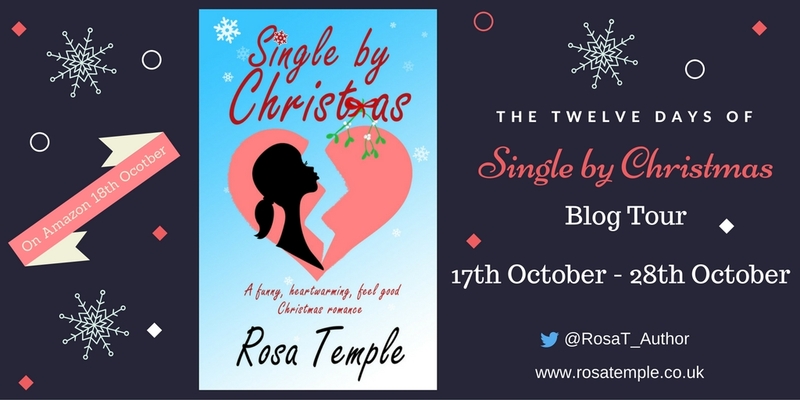 When I told a friend of mine that I had written a novel called, Single by Christmas, she asked if I didn’t mean, ‘Married’ by Christmas. After all, she told me over the phone, isn’t that what happens with heroines in the type of book you write? Well I had to point out to her that sometimes genres can be turned on their heads and for all she knew my heroine might just be married by Christmas because I’d managed to weave it into the story by way of a massive plot twist – the title might be red herring I told her. After hanging up, I thought a lot about what she said. Chick Lit novels and the type of romantic comedy that I love to write usually call for a Happy Ever After, don’t they? But that made me wonder, should a woman go all out to find the perfect man in time for a big holiday like Christmas, in the tradition of true love, or does she forget about men and try for the kind of Christmas that everyone loved once upon a time – the Christmas that’s all about family and friends. If you’re happily in a relationship then this won’t really apply to you, but I have a few single girlfriends who are not relishing another holiday season without the arms of a hunky guy wrapped around them. It’s not as if I don’t get that, but why put yourself under so much pressure when it is only one day after all? Somehow the true meaning of Christmas gets lost if all the single women are going Bridget Jones crazy and singing, “All by Myself” just because there isn’t a man around. Instead, I say, down with love (or at least searching for it for a while) and get out your old turkey baking tray, Christmas cake recipes and invite family and friends over on Christmas day, instead. It’s the perfect time of year to catch up on old friends and people you haven’t seen in a while. So why not throw a party? I remember moving to a new flat some time ago and when it came to Christmas I decided I’d invite lots of people around. I threw an open house party; cooked a big pot of chilli, a big one of mulled wine (which got topped up frequently) and opened my doors from the afternoon onwards. The idea was that people would come and leave after a while making room for the next bunch of people who came in. Trouble was, it was such a success, no one left and my poor little flat was bursting at the seams. But it was a great Christmas party and one I’d love to capture the spirit of again. Mr Perfect or no Mr Perfect, you can still have a good time. This year, I will be doing what I love to do best at Christmas time; every evening I get cosy on the sofa, lights on the tree twinkling and I indulge in a slushy film on the television. Then to top it all, on the day, I go crazy in the kitchen, whipping up a load of food for the family. Later I’ll be lying on the sofa in a daze while keeping a watchful eye on the Ferrero Rocher, hoping the rest of the family don’t eat them all before I have space. Sounds pretty indulgent but that’s a Merry Christmas for me and I’m pretty sure that instead of trying to find Mr Perfect in time for Christmas, you’d have a great time with the people currently in your life and who already love you loads! 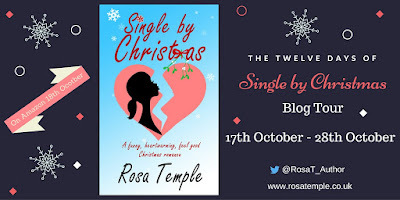 Thank you so much for this post Rosa, I can pretty much guarantee I will be "Single by Christmas" as I always am, but always tend to get into the festive spirit regardless. Merry Christmas! Take a break in Hideaway Down. It's the perfect place to find romance. Make new friends, meet up with old ones and maybe even fall in love. When Rachel Simpson’s boyfriend, Drew, suggested they should take a break, she thought he meant together, so she rented a holiday cottage in the picturesque village of Hideaway Down for the perfect, autumn getaway surprise. Except she was the one who got the surprise, and now she is spending a week alone in a cottage by the sea. Not quite the fun, romantic break she was hoping for. Lucas Webb needs to get his act together – or so his friends keep telling him. He’s been like a bear with a sore head since his girlfriend dumped him… and that was several months ago. Perhaps a change of scene is what he needs. At least he still has Monty, his beloved dog… and a break by the sea will probably do them both some good. Is it simply bad luck that this is one of the wettest, windiest autumn weeks since records began? Or does the universe work in mysterious ways? It turns out a new Emily Harvale book on my kindle is pretty much irresistible, and so I started this within a few days of it appearing. Within a few pages the book, to pardon an expression from new to the series Billy Brookes, felt like a pair of old worn slippers. 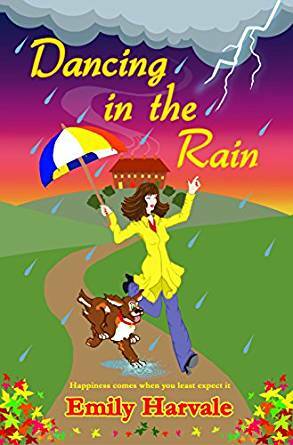 Just what you need after a hard day at work, something very warm and comfortable to slip inside - which is just what Dancing in the Rain is, especially to fans of the Hideaway Downs series. This is the fourth book in this series and can easily be read as a standalone, but given how good the other books are, and the fact they are all fairly quick and highly enjoyable to read, I'd still recommend starting from the beginning. There are updates to all the recurring characters of the series, as well as some new guests to the cottages. In Vine Cottage we have Billy Brookes who is a builder in his fifties, that Janet is very happy to meet...after all she has been looking for a builder for months. In Ivy Cottage, we have Rachel Simpson, who has very recently been dumped by her boyfriend Drew. She originally booked the cottage after he had suggested they go on a break...but that wasn't quite the sort of break he meant, and so she is dreading a week alone in a cottage, especially when arriving in the pouring rain. Then in Mistletoe Cottage is Lucas and Monty. Monty is a loveable dog, and Lucas has also got a quite recent ex. He has been told by his friends he needs to get away for a bit, and found this cottage. Again arriving in the rain isn't quite what he had in mind. After a power cut on their first night, Lucas and Rachel spend quite a bit of time together and lets just say their holidays take a turn for the better, despite the un holiday like weather! Although Hideaway Down is not looking its best, the sense of camaraderie and community spirit is still present, and lots of the action takes place in local pub The Snowdrop Inn. There are great pillar of community communication, so that anything that happens is around the village, before you have taken your next breath. It was fantastic to see the Gaggle Gang are still about, and if you have no idea what a Gaggle gang is, then I do urge you to read the first book, to see just what these geese are all about! Dancing in the Rain is a great autumnal book, given the incredibly dodgy weather that is usually present in the fall, but will be an enjoyable book whenever you read it. It has a gradual romance that creeps up on two people, and there is a really romantic moment that fans of the series will love, and new people will still agree is lovely, even if they don't know the full back story to the moment. Dancing in the Rain, is a relatively short book, that is very quick to read, and I finished it in two reasonably short sittings. It is a pleasure to read, and is another incredibly good addition to the Hideaway Down series. Giveaway open internationally, all options are voluntary, but please do what they ask, as I will be verifying the winner. Giveaway closes 23:59 8/11/2016. Winner will be announced on twitter and emailed, and they will need to reply within 7 days, or forfeit the prize, and I will re-draw for a new winner. Good luck everyone.